Donkeymails Review – Scam or Legit? Donkeymails is a PTC site in which you can earn money by clicking ads, reading emails, completing offers. You can earn up to $0.001 to $0. 01 by clicking ads. 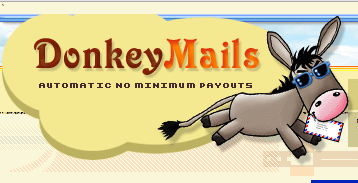 Donkeymails proves different features to earn money. You can earn money from donkeymails by reading emails, completing offers ,clicking ads and other tasks.You can earn up to $0.050 by clicking ads and reading emails. There is a Paid to promote links feature, in which you can advertise the ptc link on to approved sites and get paid on click basis. The exchange rate is $0.50 for 100 credits. You can earn money from offerwalls like PTC wall, Matomy, virool videos. When you complete offer you will get cash and points. Points can not be converted into cash, you can use points only for advertising. You can earn more in donkeymails by having referrals. The more referrals you have, your earning will be more. In Donkeymails , There is 5 level referrals system.You will earn 10% of your direct referral earning (direct referrals are the referrals which you refer) means you will get 10 % from 1st level earning, 5% from 2nd level earning, 2% from 3rd level, 2 % from 4th level and 1% from 5th level referrals. If you have a lot of referrals, your commissions will be great.If your referrals complete paid to sign up or if they win a prize, You will not get the commission of that. Without referrals, your earning will be slow and if you do not know how to get referrals, then visit our no.1 online work which will help you to make referrals. There are a traffic exchange programs. In which you need to surf their link and they will surf your link. Your links can be others ptc,gpt site links. Each link will give you 0.50 credits. You can use these credit to promote your links. You can use the payment processor like Paypal, Payza, Egopay, Okpay, Paytoo, Perfect Money. Your payment will proceeds within 14 days. There is no limit for referrals. You can refer unlimited numbers of peoples. Donkeymails has been online for more than 10 years. Donkeymails is free to join. The minimum cashout is only $1. PTSU offers are not a good way to earn money.Donkeymails provide PTSU offers, in which you earn money when your completed task is approved by the advertiser. Many times you will not get paid, so leave those offers. If you want and give your time to those offers, it’s up to you. Donkeymails don’t have a forum. If you have any problem or issue you can not discuss it with other members or the staff of Donkeymails. Any questions about Donkeymails, Please ask freely by dropping comments below. We will reply you shortly.